Plywood is one of the most extensively used materials in the construction of houses and furniture making. You would find the use of plywood in most of the wooden furniture in your home and even the floorboards installed in your flooring. Since it is an engineered wood, working with it is slightly different than what you might normally expect when working with natural wood. You must keep this in mind when making any repairs to the furniture made from plywood or making a new project using this material. One of the debates that most people working with plywood have is regarding the fasteners to be used for plywood, nails or screws. To settle this debate, let us consider both nails and screws for plywood and then decide which one among them is more suited for fastening plywood joints together. Consider the nails first. When making use of a nail for plywood projects, the biggest issue that you might encounter is of splitting the wood. Nails for plywood have to be hammered in and a slightly careless blow can get the nail bent or even worse split the wood. This is the reason why most professionals don’t recommend the use of nails as fasteners for plywood. However, if you are in a fix and the only available option is a nail then be sure to make use of the proper type of nail and place them at a suitable distance from the edge of the plywood and at a fair distance away from each other. The reason for this is that the closer the nails will be bunched together, the greater stress they will produce inside the layers of the plywood which might eventually lead to cracking of the wood. Screws on the other hand are considered by many professionals to be the right choice when it comes to fastening plywood joints. The reason for this is that they are able to hold themselves better in the plywood and prove to be better fasteners than nails. A screw can take much more abuse than a nail and still stay together because of the grooved staff that it has. 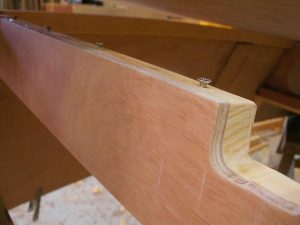 Moreover, the screws do not cause the plywood to split like the nails especially if they are sunk along the edges of the plywood and are done so using the right technique. This can happen now matter how thick and heavy plywood is. 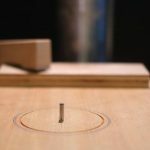 When making use of a screw as a fastener for plywood joints, it is best to drill a pilot hole into the plywood first and then proceed to the task of installing the screw in. Make sure to center the screws on the edge of the plywood in order to ensure that they hold in the plywood properly. There are a number of screws for plywood that you can use for the purpose of joining plywood panels together but the best ones among them are the grabber screws and the gorilla screws. A great way of speeding up the process of screwing is to make use of a screw gun. It is going to eliminate the hard labor that you will have to do in getting all the screws sunk in manually.